Two southern Alberta ranches are among those who have found a two-stage calf weaning program is not only much less stressful for livestock and improves rate of gain, it also makes for a much quieter weaning week. 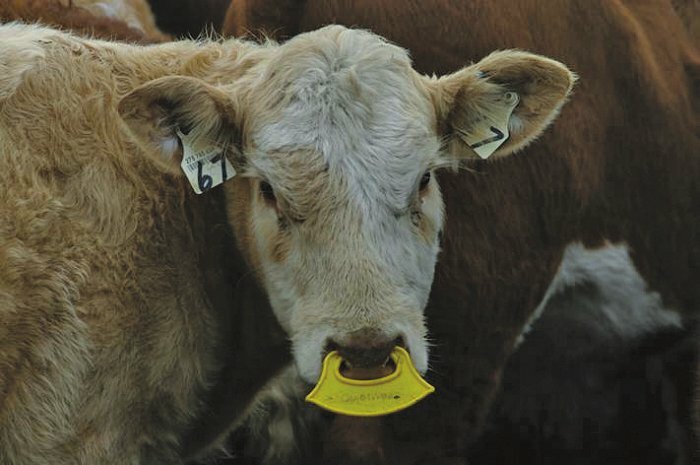 The two-stage weaning system involves processing calves about a week before the actual weaning day to apply a commercially available plastic guard, or nose flap, in the nose of each calf. It is a small plastic plate, about the width of the muzzle and three inches deep, that just clips into the nostrils, similar to the plastic closers found on many bread bags. The Canadian-made flaps are marketed by the Saskatchewan company Quiet Wean. Calves are then released back into the cow herd. In most cases the nose flaps prevent the calf from nursing its mother. Within four or five days the calf forgets about trying to nurse, and then calves and cows can be separated. On weaning day, calves can quickly be run through the chute again to remove the nose-flaps, which are reusable next year. The two-stage weaning program eases calves into weaning. Research shows calves that are conventionally weaned — simply one day removed from milk and their mothers — will spend the next two days pacing and walking as much as 25 miles, bawling and looking for their mothers. 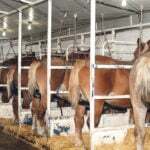 Among calves that have been weaned with the two-stage system using the Quiet Wean nose-flap, walking is reduced to about 10 miles, and there is very little bawling. Chad Monner, who ranches with his uncle Michael Monner, has been using the two-stage Quiet Wean weaning system with their 240-head commercial cow-calf herd at Milo in southern Alberta, for about six years. About a week before actual weaning, they process calves through the chute, apply the nose flaps as well as vaccinate and turn the calves back out with their mothers. A week later they sort the calves for weaning, remove the nose flaps, apply a topical pest control, and put calves into their on-farm backgrounding operation. Monner says the tags, which cost about $2 each, are easy to install and remove. He says there is very good retention, estimating they may have to replace about 10 per cent each year. For their operation applying the nose-flaps is one extra step in calf processing in the fall — they plan to vaccinate and apply insecticide anyway, but Monner says it really doesn’t take that long, and overall it improves calf performance. The Blades family at Nanton, Alta. has been impressed with how smoothly and quietly weaning week went in 2013 after following the two-stage weaning program for the first year. They wean their 600-head cow herd on Rocking P Ranch in three bunches of about 200 head at a time. “We were really happy because you could see the difference,” says Mac Blades. “We background our calves every year, bring the calves home from pasture and put them in the corral for a couple days or more to allow them to settle down and then put them out on pasture again. 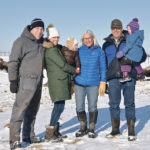 Mac and Renie Blades operate Rocking P Ranch along with their son and daughter-in-law Justin and Mida and their daughter and son-in-law Monica and Blake Schlosser. They pay attention to practices that can reduce stress in the cow herd, and maintain good records — all cattle are tagged, calf birth weights and vaccination protocol is recorded. While the ranch headquarters are just west of Nanton, they have a second place and most of the summer pasture south of Chain-of-Lakes. With actual weaning day planned for late October, they moved portable corrals to the three pastures to capture calves and apply the nose-flaps and vaccinate about a week before weaning. 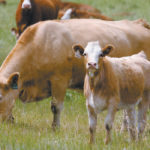 Calves rejoined their mothers for five to seven days before being sorted, weaned and hauled home to corrals at the main ranch. Blades says they will definitely be using the nose flaps in coming seasons. 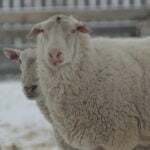 Admittedly they got a lot of comments from people who saw calves on pasture with the yellow nose flaps on their faces. 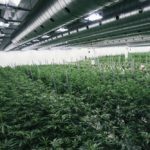 “But I’ve also talked with a few neighbours who say they plan to try it themselves this year,” he says.